St. Maria de Olearia is an ancient rocky installation that goes back to the 10th Century. All dug in the rock, made bigger and bigger until it became a monastery. Built with three different chapels one above the other. On the first level we find the most ancient of the chapels, known as "Chapel of the catacombs" or "Cripta". It's on the wall of the front part of the Cripta that we find the better kept frescos of the entire complex of St. Maria de Olearia: it's the "Vergine coi Santi" (Our Lady with Saints). 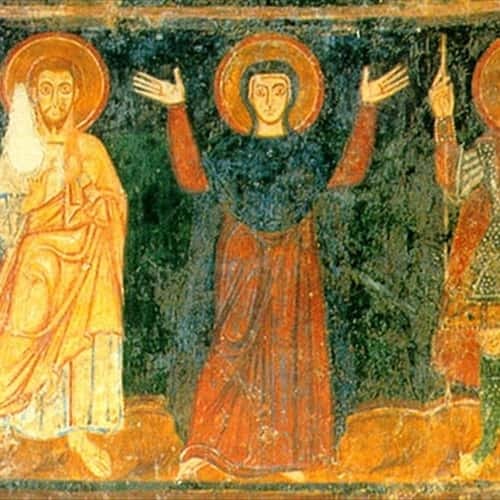 On the right of the Virgin a bearded Saint with a white tunic, red clubs and yellow mantle; on the left a saint with arms. Following on in the Cripta we find "Tre figure con aureola" (Three figures with halo), the heads of which have been removed; they are probably Jesus, St.John the Baptist and St. John the Evangelist. The central apse of the Cripta shows Christ dressed with a white tunic and a golden mantle. On the sides two angels dressed with byzantine clothes. Stairs from the Cripta take you to a terrace in front of the main chapel. The main chapel is constituted on environment with shaped as a cross and other spaces with vault to barrel. The vaults shaped as a cross shows a central frame where probably there was a figure of Jesus. In the chapel there are the following pictures: "L'Annunciazione" (the Annunciation of our Lady), "La Visitazione" (the Visitation), "L'Adorazione dei Magi" (the Adoration), "Il primo bagnetto di Gesù con due levatrici" (the first Jesus's bath) and other scenes of Jesus's life, until his death. From the terrace in front of the main chapel you can reach the Chapel of St. Nicola, thanks to many stairs. Outside of this, on the façade overlooking the courtyard you can see a medal with the hand of God and, close to that, two figures of "Angeli Osannanti" (Singing Hosannas Angels). 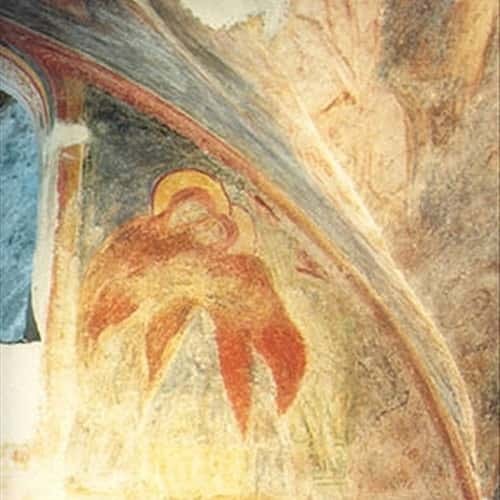 In the apse of the chapel there is the "Virgin with baby"; on her right St. Paolino and on the left St. Nicola, both identified thanks to writings, both dressed with episcopal clothes and holding a book. On the arch of the apse there are St. John the evangelist and St. John the Baptist. 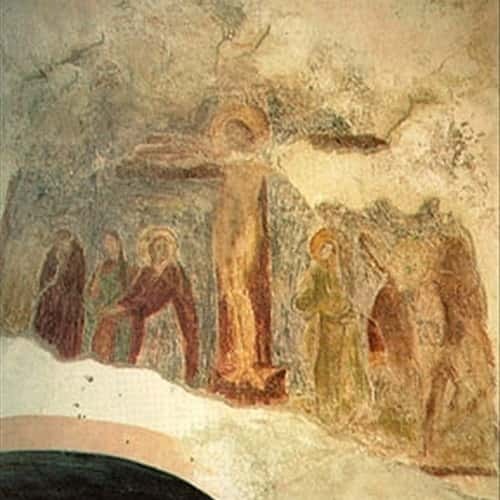 The other frescoes are: "Storia di Mare", where St. Nicola saves three man from death, "St. Nicola appears to Costantino", "St. Nicola appears to Abalabio". 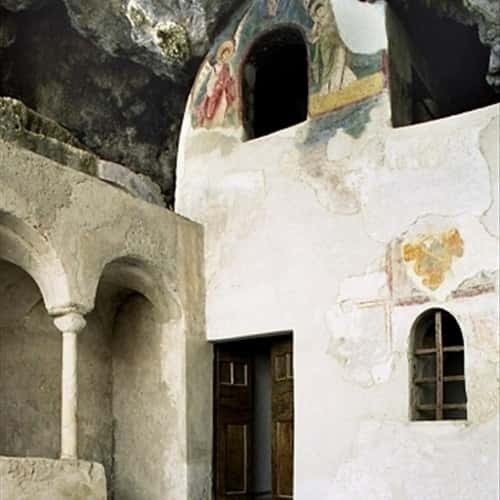 The frescos of the two chapels suggest that they belong to the 11th Century.